Stone Bear Carving hand carved by Santa Fe artist Michael Connor. 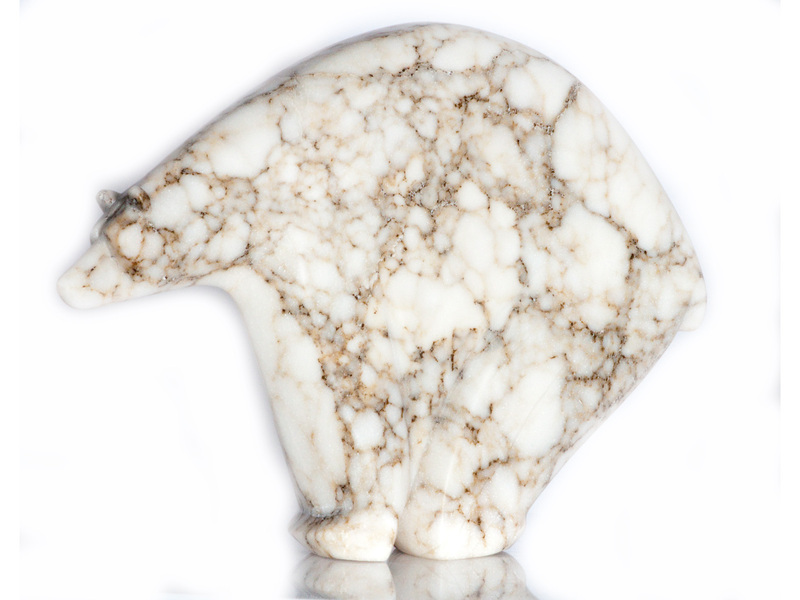 This striking Zuni style bear is perfect for the office or home. The sculpture measures 7″ inches tall by 9″ inches wide. We ship sculptures via UPS Ground. For centuries, Alabaster has been recognized around the world. This gemstone was named after a town named Alabaster, in Egypt, which is also one of the sources of Alabaster. In ancient times, Alabaster carvings were found in the tomb of King Tutankhamen. Drawing stone is one of the popular names of Alabaster, which has the magnetize things towards yourself or draw things to you. Michael Connor was born in Wiesbaden, Germany in 1958. His mother is of Nordic and German decent and his father is descended from two tribes of the Ojibwa Chippewa people of the St. Croix and Fon du Lac territory near Danbury, Wisconsin. In the early 1980s he answered an ad from a jeweler for a mechanic. While waiting for the boss he found the wax table used for jewelry making. One thing led to another and he finished a beautiful wax ring. The boss hired him on the spot to design and make jewelry for the store. By the late 1980s, Connor found himself in Santa Fe working for sculptor Jon De Celles. At this point Connor began to feel that he was being guided on a path; that he had a knack for working in stone. I was blessed enough to see that my gift was the answer and would save my life,” says Connor. The rest is history. He began carving his wonderful bears in Alabaster. Connor says that he carves his animals with love in his heart and soul.